The Mass Effect saga continues in graphic novel form with the just released first issue of Mass Effect: Evolution. Thanks to Dark Horse Comics, we are giving members of The Escapist a chance to win a copy, along with a copy of Mass Effect: Redemption, just to bring you up to speed! 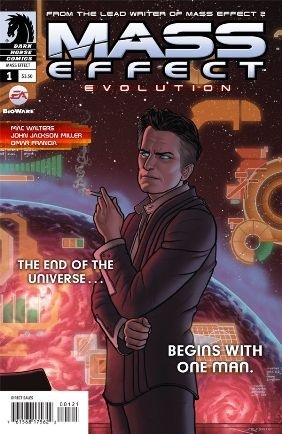 The Mass Effect series continues with the just released graphic novel Mass Effect: Evolution that revolves around The Illusive Man and how he came to power. Even better, the same blockbuster team is back to continue this epic series: Mac Walters (BioWare lead game writer) & John Jackson Miller on script, Omar Francia on art, Michael Atiyeh on colors and Joe Quinones joins the team for the cover art. Want to win the first issue of Mass Effect: Evolution and a copy of Mass Effect: Redemption? We have 10 prize packs to give away that include both, so click here for all the rules and good luck!